The Brisbane 18 Footers sailing Club sail more than 18 footers. We cater for sailors of all ages and experienced levels. Our classes include Sabots, Flying 11s, 125s, Corsairs, Lasers, 10 foot skiffs, Historic 18s, Classic 18s and even a few Winged 18 foot skiffs. The Brisbane 18 Footer’s Sailing Club was officially formed in 1921, and apart from the war years, 18 footer racing has been conducted from the Club ever since. 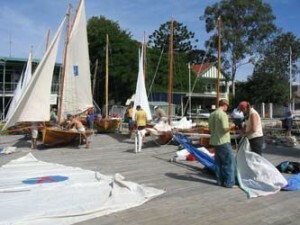 The Clubhouse was situated on the banks of the Brisbane River at Bulimba, directly opposite Kingsford Smith Drive, Hamilton until 2008 and now races on Waterloo Bay, using the Darling Point Sailing Squadron as its racing base for the 18ft skiffs, and the Brisbane Sailing Squadron on Bulimba Point for the Historical Skiff classes and junior sailing.